SolidWorks Rx- Are you machine better than mine? The hardware performance always a topic of discussion when a group of user hanging out. Want to know what is the level of performance of your hardware? Do your hardware performance meeting your expectation? Are mine better than yours? Purely compare with your mouth and ‘feeling’ is not a good approach i would say. 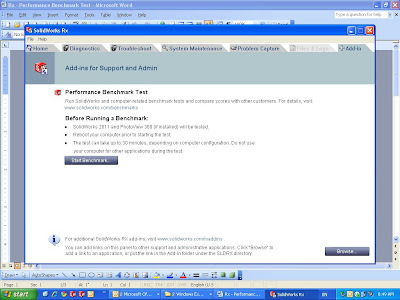 Introduce you the all new feature in SolidWorks Rx 2011 – SolidWorks Performance Test. 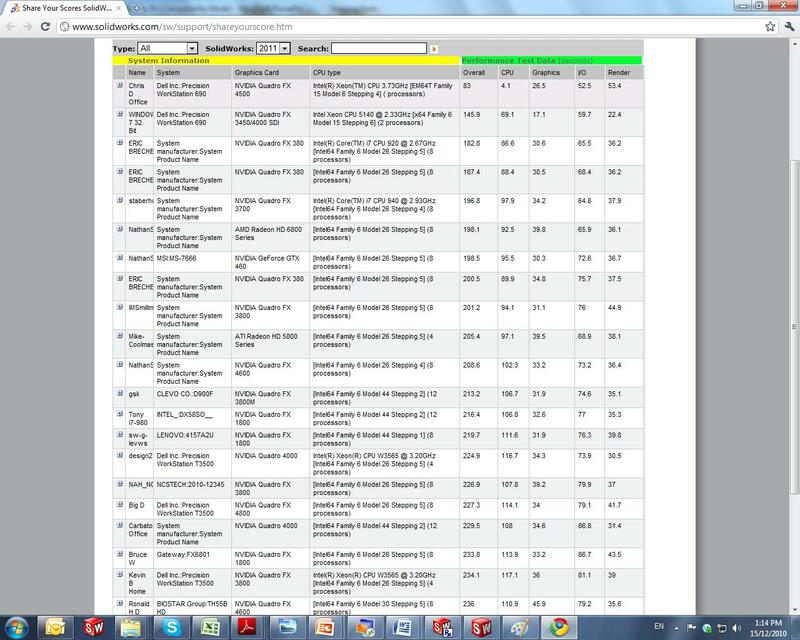 You can find it by going to Start >All Programs >SolidWorks 2011 >SolidWorks Tools >SolidWorks Performance Test. 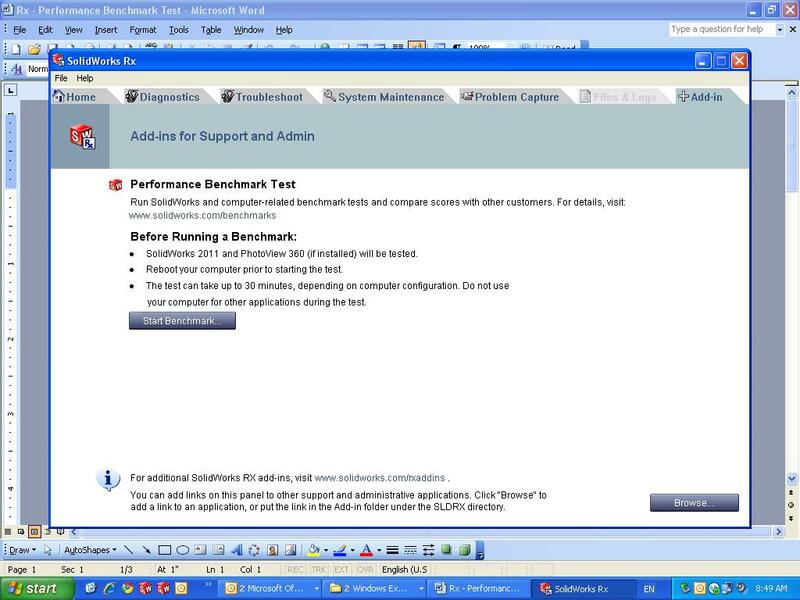 Keep in mind that you will need to have SolidWorks 2011 and PhotoView 360 in order to run this test. The test has three areas; CPU, I/O, and Graphics. Each step of the test is meant to exercise a specific area of the computer using SolidWorks. 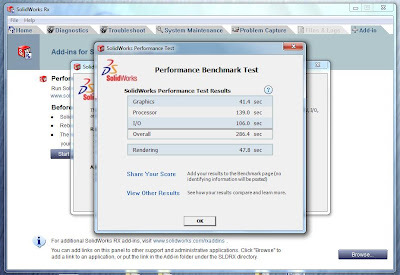 This tool took merely took half an hour to perform a benchmark testing on your hardware, including time taken to open a SolidWorks file, rebuild a file, rendering, etc…. Total of 5 times it will run (in the half an hour time) and average result obtains to ensure the accuracy. 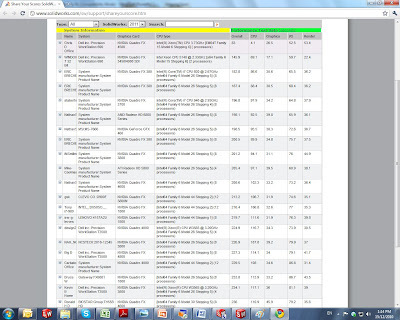 This is the result that I obtained from HP Z400 Workstation, what about your score? Try it now with SolidWorks Rx 2011. You can even share your score at SolidWorks website (http://www.solidworks.com/sw/support/shareyourscore.htm) to let other SolidWorks user to do a comparison. Of course, you can view the result shared by other user with different hardware configure. You next hardware? Do consider to refer “share your score” for the best performance and budget that suit your need. What is a good book that can help beginners learn solidworks on their own?